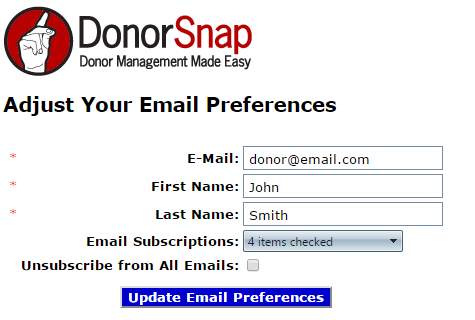 Email Tools -- Are you getting the most out of DonorSnap? As more and more features are added to DonorSnap, it can be easy to miss the memo on some of them. Over the next few months we will point out a few of the features that you may not be using yet, or may not even be aware of. While DonorSnap isn't a replacement for an email marketing system like Constant Contact, it does have powerful email functionality for some typically mailed letters. Imagine no printing, no envelope stuffing, and no postage! Remember those year end contribution letters that you just sent out? You've got it... DonorSnap can email those for you! 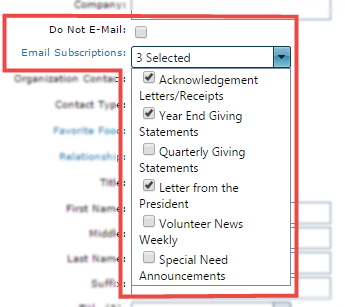 Best practice for using the built in email tools is to receive permission from your donors before sending letters and statements by email. Get started by changing your dialogue with supporters. Ask for email addresses and permission to email them with regular communications. If your donors are expecting to receive communication and documents in the mail, an email only version might not be a welcome change. With a structure like this set up, you're ready to take advantage of any DonorSnap email tools while also considering the preferences of your donors. 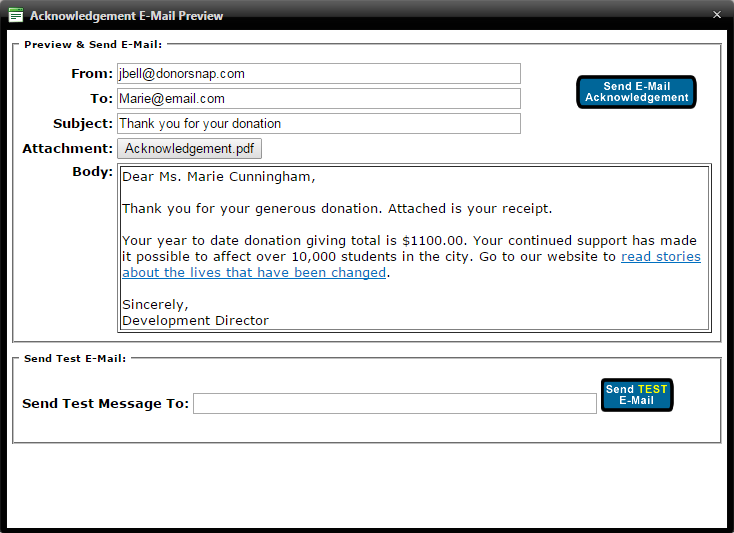 Email Contribution Statements allow you to send out your year end (or quarterly/monthly) statements right from DonorSnap. 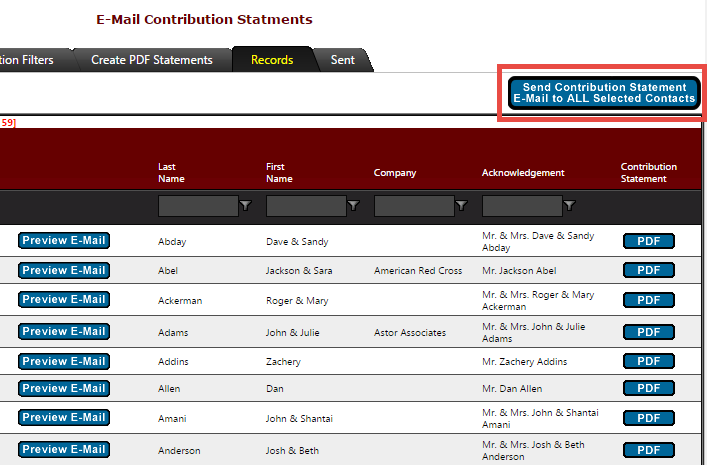 The email version of this tool generates the same pdf report as the printed version, but it includes the ability to personalize an email message that the statement is attached to. Email Acknowledgement Letters works with the same Word mail merge letters that you upload to your site for printed acknowledgement letters. You can send a personalized email with this tool as well using your database fields as mail merge codes. Once you have generated your letters, preview and test individual letters like the screen above shows. When you are ready, you can send all of your letters with the press of one button. There's no need to individually send each one because DonorSnap batches and sends them for you. Need some extra help setting up your database for managing your email lists? Check out the Best Practices for Managing Email Lists Training.